I would like to educate every common man who saves penny for buying a new product. 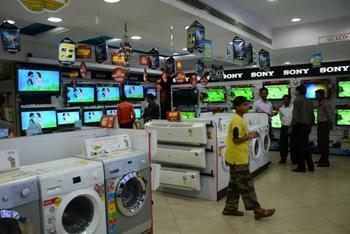 Buy a branded consumer durable, do not go after non branded products. Though the non branded products cost less but there is problem with after sales service and spare parts. Do some research work both online and offline before buying the product. Get reviews from people, do not be ashamed to talk to them. This will help you in purchasing the right product for your home with full utility for your money. When the research is done the next question which arises is from where to buy the product. Friends every branded company has got a website and go to that particular website. Like Godrej company website is http://www.godrej.com which is the actual website of the company. The company website will be with the company name, always remember. When you do the search on google you will get other links too but try to search the correct link and visit the company website. Then go and check the contact us and locate the dealer in your state. Once done call the person and talk to him. If you are having problems locating the correct authorized dealer call the customer care and tell them your problem. They are being paid to help you. Do not hesitate to talk about your problem. You can also dial corporate numbers if your query is not solved. They are there to serve you. The number is mentioned on the site and you can talk to them. Once all your queries are resolved you can take a decision. You can decide about the product which suites your need. You will also get a good after sales service after buying the product. Don't be in a hurry to bring home your dream product. Do research and then take a decision. I would like to give my own example here. I want to buy Kent water purifier. I talked to a lot of people and they said they were facing problems with the after sales service. I called Kent and talked to them . They told me the problem was the customers bought the product from unauthorized dealers and so the company had no records of the particular customer and hence they faced problems with after sales service. I talked to lots and lots of people and got their feedback. This really helped me take the correct decision and now i have decided to buy Kent from Kent website online. Be aware of everything around you, listen to your sixth sense, take opinion of every member of the family and friends, then take a decision. Spend your money judiciously. After all it is your hard earned money and the product which is brought home should serve you in the best possible way. After Navratri, Dhanteras is coming so take the right decision and become proud owner of your dream product.